Throughout the tropical and subtropical Indo-West Pacific. Upper: White juvenile animal without symbiotic zooxanthellae and larger brown animal in which symbiotic zooxanthellae are nurtured in ducts of the digestive gland both in the cerata and the body wall. Lower: Adult Pteraeolidia feeding on the solitary hydroid Ralpharia which is its preferred adult food. Coffs Harbour Region, New South Wales, Australia, December 1990. Photos: Bill Rudman. Pteraeolidia ianthina, commonly known as the 'Blue Dragon' by divers in eastern Australia, is one of a group of remarkable aeolid nudibranchs which are way ahead of man in harnessing solar energy. Pteraeolidia has evolved a method of capturing and farming microscopic plants (zooxanthellae) in its own body. 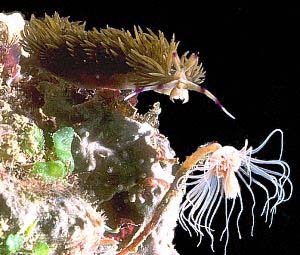 The plants flourish in this protected environment and as they convert the sun's energy into sugars, they pass a significant proportion on to the nudibranch for its own use. The white animal is a juvenile which as not yet developed its crop of zooxanthellae. If this species is similar to others that have been studied then it must obtain its first "injection" of zooxanthellae by feeding on a hydroid with symbiotic zooxanthellae. White juveniles are usually found in lush growths of short "turfing" hydroids, but until now no sign of zooxanthellae has been found in the hydroids. Adults can last some time without feeding, presumably obtaining sufficient nourishment from their zooxanthellae gardens. 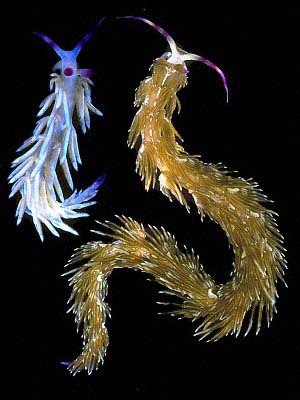 The large solitary hydroid is the preferred adult food. • See Yoshi Hirano's message about egg-laying. Angas, G.F. (1864). Description d'espèces nouvelles appartenant à plusieurs genres de Mollusques Nudibranches des environs de Port-Jackson (Nouvelles-Galles du Sud), accompagnée de dessins faits d'après nature. Journal de Conchyliologie, 12: 43-70.